Let's learn from the failure of the War on Drugs. We targeted supply: how did that work out? Squash one producer or dealer, up pops another. Block one pipeline for pushing product, and another channel opens up. Successful approaches engage demand. It's been said that we're addicted to fossil fuels, why not have an intervention? When the Ford Model-T rolled off the assembly line in 1908, it got between 6 to 9 kilometers per litre. The mayor of my city, Rob Ford, drives a Cadillac Escalade that gets between 6 to 8 km/L. The Ford Focus, a "fuel efficient" vehicle gets about 13 km/L. When it comes to fuel economy, the auto sector has stagnated for over a century. So what does this have to do with climate change? Tar sands? Pipelines? I'm the executive director of Our Horizon. 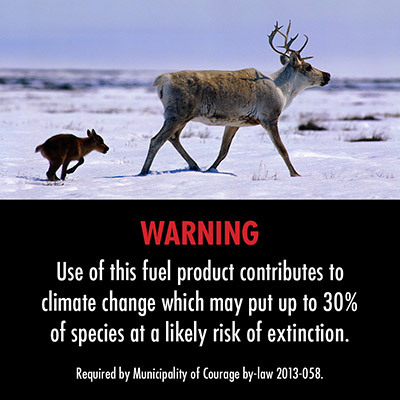 We're a new not-for-profit organization that wants to put climate change warning labels on gas pump nozzles, just like those on cigarette packages. I've been sharing the idea for a few months and it's got a lot of traction but, being a new idea, it's still hard for many people to fully grasp the impact it could have. So here's a crash course in economics: the value of a commodity is determined by its uses. It's hard to address the tar sands or climate change if demand for fossil fuels remains constant. It's difficult to stop a pipeline if we're all still thirsty for the product it's moving. If we want to have a meaningful impact on any of these issues, we need to ask the question: "How do we use this stuff?" Let's start by looking at cars. The internal combustion engine converts only about 20 per cent of the chemical energy stored in gasoline into mechanical energy to power the wheels forward; much of the rest is lost to heat and exhaust. Further, if a vehicle weighs about 4,000 lbs and the person driving it weighs 160 lbs, the thing that we actually want to move is only 4 per cent of the total weight. If you do the math, you realize that less than 1 per cent of the energy in gasoline is actually used to move you! So for every $1.00 of gas we buy, $0.99 is wasted. And every time we drive our cars, 99 per cent of the pollution we emit is pointless. We've created a system that makes us pay to move heaps of metal back and forth for our entire lives. Now imagine if we used other natural resources this way. What if we chopped down, harvested and processed 100 trees only to just use one? Or what if I let my kitchen tap run for about 15 minutes every time I wanted to fill just one glass of water? How is our wasteful use of energy any different? The good news is we don't have to be so wasteful. Shell hosts an Eco-Marathon every year where high school and university students make vehicles that routinely get over 2,000 km/L on conventional gasoline. This year, the most efficient gasoline prototype vehicle in the European competition got close to 3,000 km/L. While these vehicles are at the extreme end of efficiency, they do raise the question, "Why can't we do better?" Why can't we have a car that gets 200 km/L or even 500 km/L? My organization's idea challenges us to do better. We often complain about climate change but think little about the act of pumping gas. There is a complete disconnect. The warning labels address this by showing the effects of climate change right in the palms of our hands. Their placement on a gas nozzle takes an activity that has been normal for our entire lives and problematizes it. The labels are a disruptive innovation to shake us out of our sense of complacency. The labels will cause some individuals to reduce their greenhouse gas emissions but, more importantly, they will create a shift in our collective demand that will facilitate meaningful action on climate change. Politicians will have more popular support to pass climate change legislation, invest in public transit and build bike lanes. Businesses will innovate by building efficient vehicles to meet the needs of a shifting market. Let's learn from the failure of the War on Drugs. We targeted supply: how did that work out? Squash one producer or dealer, up pops another. Block one pipeline for pushing product, and another channel opens up. Successful approaches engage demand. It's been said that we're addicted to fossil fuels, why not have an intervention? Why not let our labels be that trusted friend that says, "Careful, this is where we're going to end up." After all, if we can't even honestly face our problem, what hope do we have in actually addressing it? Indeed, the labels are a requisite for meaningful action on climate change. Want to stop climate change? Tar sands? Pipelines? Disrupt demand. Help us pass these labels into law by supporting our crowdfund. 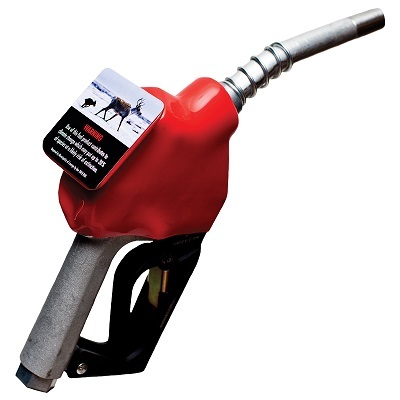 To learn more about how we're going to get these labels on gas pumps all over Canada and then the world, please visit the Our Horizon website.